Question: Which country is the best at putting the Web to use? Very close, but not quite. That would be Sweden, according to a new report spearheaded by Tim Berners-Lee, the guy who basically invented the World Wide Web, WWW. I know many Americans would not agree to this, but hey this is just one study. Take it with a pinch of salt, if you like. The Web Index is the measure of the Web’s use, utility and impact on people and nations. The United States came in second place on the much-anticipated study, which was published online Wednesday by the World Wide Web Foundation. 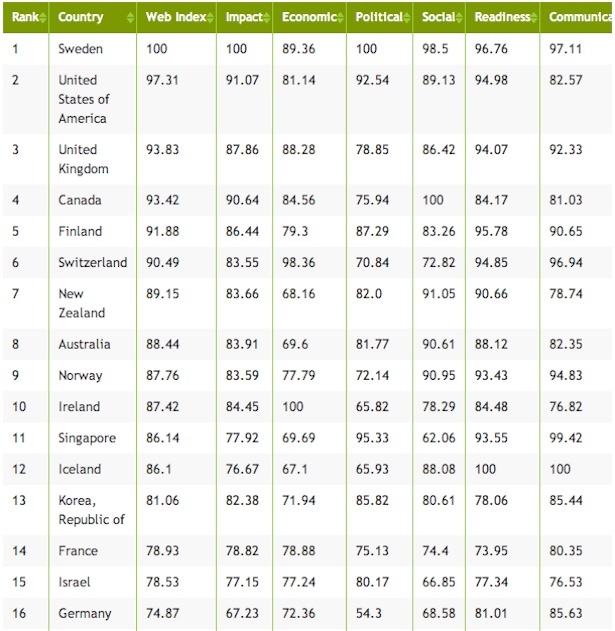 Called the Web Index, the first-of-its-kind report ranked 61 countries across seven categories, including communications infrastructure, Web use, Web content and the political, social and economic impact of the Internet in those countries. The group, in collaboration with Oxford Economics, collected five years of data from other sources and spent a year conducting surveys to arrive at its conclusions. The report was funded in full by a $1 million grant from Google. Yemen, the violence-plagued Middle Eastern country, ranked last on the list, behind Zimbabwe and Burkina Faso, both in Africa. Overall, one in three people worldwide use the Internet, according to the report. But Web use is uneven. Only one in six Africans use the Web. 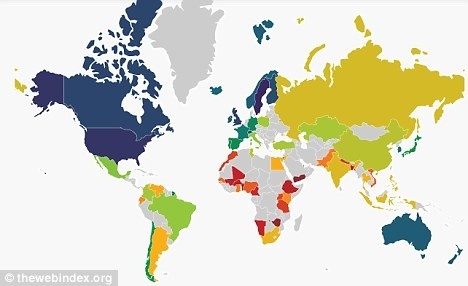 Sweden beat out the United States on the ranking in part because a smaller percentage of Americans are online. About three-quarters of American are Internet users, compared with about 90% of Sweden's population. Meanwhile, "the U.S. has a lower percentage of households with personal computers than a raft of countries, including Canada, Ireland, Japan and Norway," the report says. The United States "also offers slower bandwidth per Internet user than a range of countries, most notably Iceland, Sweden and Singapore." The United States is No. 1 in terms of access to Web content, which the report measures in terms of the number of Wikipedia articles in a particular language as well as "the type of data and information that is accessible on the Web in each country." Iceland topped the list in terms of its Internet infrastructure and Web use. Nearly 96% of people in that country use the Internet, according to the report. To see the complete list, visit the Web Index. Now, where's Malaysia? Why isn't Malaysia included in the report? Currently, household broadband penetration in Malaysia is 63.95%, so, we should sit somewhere between 20th and 30th place. As for Sabah, broadband penetration is about 35%, that is way below the national average. Internet is now new way of life. People is not going to live without it.